Cain Industries offers an extensive selection of boiler economizers specifically designed to recover BTU exiting the exhaust stack and transfer it back into a desired heat sink. Our broad line of economizers cover the spectrum of boiler sizes, ranging from very small hot water boilers with burner inputs of 200,000 BTU/hr to large boilers delivering steam at 250,000 lb/hr. Selecting the appropriate heat exchanger or waste heat boiler involves much consideration. Important areas of concern are controlling/bypassing exhaust waste heat, optimizing heat transfer performance, steam operating pressures, equipment size, weight and installation. BTU is transferred from the exhaust of incinerators, thermal oxidizers, catalytic converters, boilers and hot oil heaters to heat sinks such as water, ethylene glycol, thermal fluids, or steam production. Suitable fuel types for combustion sources include natural gas, propane, digester gas, diesel fuel, and light to heavy fuel oils. Tremendous fuel savings typically pay for equipment and installation within 1 to 3 years of average use along with pollution reduction due to lowered fuel usage. Why select a Cain HRSG versus a conventional Firetube Boiler? 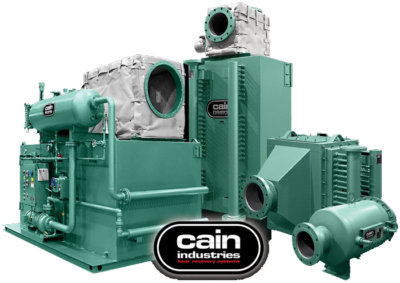 Read more about Cain Industries Heat Recovery Systems. © 2019 Illingworth Engineering Company. All rights reserved.